Have you ever been in a meeting but can barely concentrate because the room is so cold? Or perhaps the sun is so strong you can’t even see the presenter in front. Creating the right environment for your meeting is crucial. A smart thermostat connected to your control panel can help your staff easily change the temperature so that everyone is comfortable. Additionally, motorized shades will help reduce glare on the screen and will give your eyes a break from the afternoon sun. Want privacy? Double roller applications allow you to choose a blackout shade so no one can see into your meeting. Then, later for a team meeting, use solar shades to block UV rays but still allow everyone to see outside. 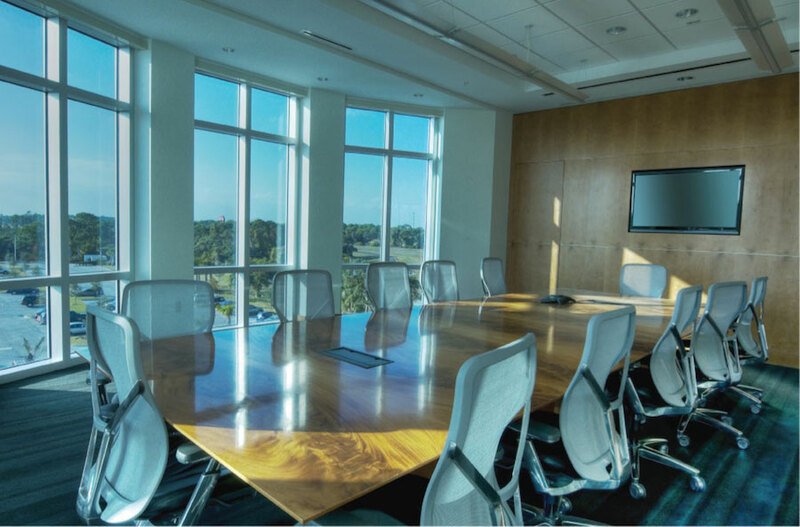 Lastly, lighting control will give you easy-to-use controls to dim the lights down for a video presentation or make the lights brighter for a collaborative session. All of these components will be quickly accessible on your conference table or a keypad on the wall. Whether you need to call in an impromptu meeting, or you have one planned months in advance, Control4 automated solutions can help you prepare for your next gathering in the workplace. First, create a scene that saves the lighting setting, temperature, projector and audio levels under one name like “Monday Morning Meeting.” Schedule this scene to start every Monday at 8:50 so that the room is ready when everyone walks in at 9 a.m.
Alternatively, a presentation setting will get the projector and screen ready, dim the lights and drop down the shades, so all of your technology is in place—removing the headache of trying to prepare all your audiovisuals. Having a video conference? We can integrate your video conferencing software so that people can join your meeting remotely quickly and easily. Why stop at the boardroom? Components Electronic Systems can integrate smart technology into your entire building. We can install security and surveillance solutions so every room can be monitored and secure, multi-room music so your staff can easily select playlists or the radio to listen to as they work, and energy-saving solutions so that you don't waste electricity and save money all year round. Are you interested in enhancing your business operations before the holidays hit? All you have to do is fill out this online form to start the conversation!